The vendor gave me a sample and yum! 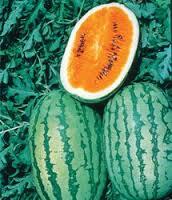 The flesh is the same texture as a red watermelon and the flavor is not quite as sweet with a hint of melon taste. Mine was seedless. I noticed the rind was thicker than a regular watermelon but that’s fine, it composted just fine. Apparently this baby was developed in the 60s. First time I’ve had one and I’m a fan. It also made heavenly sorbet 🙂 I bet it would be good in watermelon gazpacho too. If you’ve never had one, try something new. By the way, I’m usually a laggard so if you all have been chomping away on these bad boys let me know how else you use them.